This article carries on a reflection started in this same journal about the marginal role of libraries in Report on Equitable and Sustainable Well-being by Italian National Institute of Statistics (Istat). The aim is to emphasize the need for new surveys able to highlight the strategic role of libraries in the welfare policies, according to the logic “what we measure affects what we do”. In particular, the article explores the contribution of libraries as “agents of social cohesion”, starting from the reading of Biblioteche sociali. 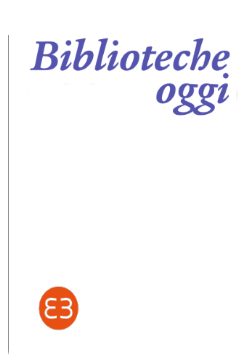 Valutazione del bando, a handbook by Fondazione Cariplo’s Osservatorio. This report analyzes the results of an assessment activity about the initiative Favorire la coesione sociale mediante le biblioteche di pubblica lettura (Support social cohesion through public libraries), a call for tenders through which Fondazione Cariplo, financed 92 projects by libraries in partnership with non-profit organizations of social or cultural sector, between 2009 and 2013.